Barefoot Flooring is locally owned and operated. During the past seven years, we’ve been voted the best local company in St. Charles County five times. Highly recognized on Angie’s List & the Better Business Bureau, we offer quality products at fair prices. Our professional and experienced sales staff is up-front and personal, offering low-pressure sales and NO sales gimmicks. We offer free in-home estimates and 12 months free financing. Our major brands include Mohawk, Shaw, American Olean, Marazzi, Tradewinds, and many more. *Authorized Mohawk Flooring Dealer* Collins & Sons Flooring America is a family owned retail flooring store. We carry and install all types of flooring and materials for floors, carpet, hardwood, ceramic, porcelain, LVT, vinyl, area rugs, backsplashes, showers, and ship lap for walls. Call us for carpet cleaning, upholstery, tile and grout cleaning as well. Collins & Sons Flooring America is ready to assist you by providing a wide selection of quality flooring in Belleville, IL. The staff at our home flooring store is proud to provide you with a huge variety of different collections of flooring brands and styles. That means you are sure to find the flooring style and brand that best suit your needs in looks, performance, and price. Our flooring store also provides any flooring installation services you need, to ensure that everything looks just as good in your home as it did in our showroom. From helping you pick out the right look for your home to installing your new floor where you want it to go, our team does everything it takes to ensure renovating your home’s flooring is a positive experience. Ensure that your home flooring is enjoyable by stopping by our showroom today. We provide you with a free consultation to help you get started. 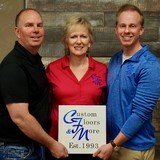 In 1993 Julie and Doug Nitz started Custom Floors & More, Inc. More than 20 years later. the business has grown into one of the busiest flooring companies in the St. Louis metropolitan area. Everyday our family owned and operated company is installing all types of flooring. With a professional staff of installers, some of who have worked in the industry over 30 years, our attention to detail is unmatched. We specialize in floor covering and installation for home remodeling projects, as well as new and custom home construction. Our dedication to customer service and personal attention is what sets us apart from others within the industry. We take the time to meet with you one-on-one to look at your floor plan, give advice and answer any questions. Kelly's Flooring has been serving the entire St. Louis Metropolitan Area since 1978! Kelly’s is family owned and operated by Larry, Kelly and Tom Murphy. We are a full-service flooring store offering carpet, hardwood, laminate, tile and vinyl. Our selection of floor coverings includes all major brand names. We take great pride in our reputation for quality flooring products and exceptional customer service. At Kelly's Flooring, customer service means timeliness, quality craftsmanship and a friendly attitude. We believe in providing outstanding service at a reasonable price for your flooring needs. For over 30 years, we have been helping friends and neighbors all over St. Louis beautify their homes with floors that are comfortable, durable, and affordable. If you give us a chance to earn your business we are confident that you will soon count yourself among the thousands of satisfied customers who wouldn't go anywhere else for their flooring needs! FLOOR COVERINGS INTERNATIONAL – WEST COUNTY & ST. CHARLES COUNTY Hardwood, Carpet, Ceramic & Porcelain Tile, Luxury Vinyl, Laminate, Natural Stone Here at Floor Coverings International West County, we take great pride in offering our clients high quality products that enhance the beauty of their homes and compliment their lifestyles. Whether you are looking for hardwood, carpet, ceramic or porcelain tile, luxury vinyl, laminate or natural stone Floor Coverings International has what you need. We know the importance of selecting the right floor for your home and it’s not always easy. With our mobile showroom you are able to view a wide variety of product samples at one time, in your home and see how each sample looks with your furnishings and lighting. Your FREE in home consultation eliminates the hassle of running back and forth trying to find the perfect product in the right color. For your convenience, we offer day, evening and weekend appointments. Starting with the selection of the product(s) to the last installation detail, Floor Coverings International West County will be there with you each step of the way. Our exceptional customer service is what truly sets us apart from the others. Call us today and we’ll help you design the floor of your dreams. Welcome to Floor Coverings International Arch City! 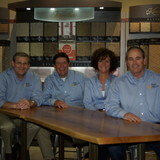 We are the premier flooring company serving the St. Louis area. We provide high quality design and installation services and carry the latest flooring products including hardwood, carpet, stone, and tile flooring! Take the guesswork out of getting new floors and schedule your free estimate in-home consultation today! We are Lincoln County's most experienced full service flooring retailer. Rich and inviting, hardwood makes a distinctive statement. Because of a great range of natural variations—from boards with extreme character, graining, and color variation to those that are evenly colored and consistent—lustrous hardwood can create a uniquely beautiful floor. Your kind of floor. Warm, stylish, and original. 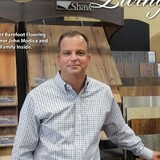 *Authorized Armstrong Dealer* Since 1984, Country Side Flooring America has provided superior quality flooring products to both individuals and businesses throughout Missouri and Illinois. From helping a homeowner remodel a bathroom floor with exquisite ceramic tile to providing plush carpet for an entire college dormitory to creating a beautifully designed entranceway to a state-of-the-art hospital, no project is too big or too small for the highly trained professionals at Country Side Flooring America. The O’Fallon-based flooring company provides a wide variety of exceptional floor covering products, including broadloom carpet, modular carpet, sheet vinyl, vinyl composition tile, solid and engineered wood, laminate, ceramic, natural stone and marble for the commercial, home building, remodeling, restoration and retail market segments. The highly skilled installation team at Country Side Flooring America receives ongoing, cutting-edge training designed to provide its clients with the most innovative flooring products on the market. All apprentices and journeymen undergo training in the International Standards and Training Alliance (INSTALL)—a prestigious four-year certification process. Many of the installation professionals have also completed training and certifications in methods such as vinyl heat welding, flash coving, sand and finish hardwood, heated floor systems and epoxy joint fill on ceramic. Advance Carpet One knows just how important it is to feel confident in your flooring selection. That's why we offer you unmatched peace of mind with our one-of-a-kind guarantee. We want you to be 100% happy that the floor we've created together is as beautiful as the one in your dreams. If not, we will replace it for free. That's what we call The Beautiful Guarantee™. And we offer an easy-to-understand warranty system that gives you a level of protection that is tailored to you. When you are ready start selecting your new flooring, we have a full showroom you may visit, or, for your convenience, we can bring samples to your home! We provide free padding with carpet installation and a limited installation guarantee. Our staff is professional and friendly. At any point, you can ask us questions or express any concerns you have. Our goal is always to provide our customers with a 100% customer satisfied experience. We are fully insured and have received an A+ rating from the BBB. When you are looking for a premier St. Louis customized flooring company, contact All Surface Flooring. If you wish to be treated with respect and care, as well as receive personalized attention and excellent flooring services, do not hesitate to call us today! Since its inception in 2003, Anji Mountain has established itself as the finest source of area rugs and office chairmats made from both natural fibers—including jute, bamboo, seagrass, sisal and cork—and recycled materials. A family business, we are founded on the principle that only sustainable uses of the earth’s natural resources can be tolerated. The astonishing renewability and versatility of natural fibers and recycled materials creates lots of new ecologically positive possibilities at a time when they are desperately needed. 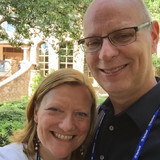 It’s our mission to bring these wonderful resources to as wide an audience as possible. Mesic Tile & Stone is a family owned and operated company that strives to provide the highest quality of customer satisfaction from start to finish in every project. With over 30 years of experience worldwide, Mesic Tile & Stone is guaranteed to meet all your standards from simple to complex designs. Mesic Tile & Stone provides high quality work at great prices with our knowledgeable staff of trained professionals. We provide highly skilled and experienced installers to execute every project to the highest quality on both new and remodeling jobs. Our projects include commercial and residential work involving ceramic tile, slate, marble, granite and quarry tile, for kitchens, baths, foyers, sun rooms, and patios. Our craftsmen have completed thousands of projects in the United States as well as in Germany, Czech Republic, and Italy. We have worked on condominiums, apartments, hotels, luxury high rises, town homes, schools, showrooms, restaurants and many other projects. We welcome the opportunity to provide a quotation on your project, and to carry through to completion on schedule, within budget, and to your complete satisfaction. Since 2005 Unique Crete of Illinois has served the greater St Louis area with creative concrete overlay and epoxy coatings for both residential and commercial clients. We specialize in decorative concrete overlays for interior flooring, garage, or exterior concrete surfaces. Our expertise in Seamless REFLECTOR™, Quarts, Flake epoxy, and Polyasprtic floor coatings is top notch in the St Louis and Metro East area. Carpeting is subject to a significant amount of wear and tear, so it’s crucial to make sure a new carpet installation is done correctly, or that an existing rug is maintained properly. Enter Saint Peters carpet dealers. From carpet repair to custom carpet design, these professionals specialize in anything and everything that is carpeting, and can help ensure that your Saint Peters, MO home’s new rug starts off — and stays! — in great shape. Carpet dealers in Saint Peters, MO help homeowners choose the correct carpet covering for their floors, and also assist with carpet maintenance. This includes determining factors like material, carpet pile, durability, color and size, as well as helping with any custom carpet design. After completing the initial installation (which includes removal of the old flooring, if applicable, and surface prep), they may also handle follow-up maintenance requests such as carpet cleaning, carpet repair and carpet stretching. Carpet dealers might work closely with Missouri contractors, interior designers and others in the home building and home improvement industry. Here are some related professionals and vendors to complement the work of carpet dealers: Interior Designers & Decorators, Design-Build Firms, Specialty Contractors, General Contractors, Home Builders. Find a carpet dealer on Houzz. Narrow your search in the Professionals section of the website to carpet dealers in Saint Peters, MO, and read reviews and ratings for pros in your area.